500GB SATA Hard Drive. Line In Port. Line Out Port. Refurbished item so there could be minimal scratches, we have cleaned all machines to a high standard before sending. 1 x Headphone Port. Front Connections. THE COMPUTER HAS CLEANED OF DUST AND FRESH SILICON PASTE APPLY TO THE PROCESSOR. Massive 1TB Hard Drive! 1 Year Warranty! Fast Ship! 1TB HARD DRIVE. Tower Desktop. INCLUDES KEYBOARD MOUSE & WIFI. Dell Optiplex. Windows 10 hp 64BIT. Genuine Microsoft Windows software preinstalled. Don't be fooled by Original Manufacturer (ex. Dell) disks. CPU / Processor Model: Q6600. Graphics Processor: ATI Radeon HD 2600. Primary Drive: 500GB HDD. Competitive Prices. Our great team provides refurbished technology; digital literacy and vocational training to as many qualified humans as possible. Includes Our Rest Assured 3 Year Warranty! Massive 1TB Hard Drive! 1 Year Warranty! Free Ship! Powerful Quad Core 2 Processor! Excellent Condition! HDD: HGST Deskstar P7K500 HDP725050GLA380 500GB Internal 7200RPM 3.5" (0A36519) HDD. RAM: 4GB 1066MHz DDR3. Optical Drive: Atapi DVD A DH16A6S DVD -RW Drive. HDD: Western Digital WD800JD-75MSA3 80GB HDD, 3.5 7200RPM SATA. Disc Drive: HL-DT-ST DVD-RAM GSA-H30N Drive. Case: 16.5 L x 7.125 W x 14.25 H.
Quad-Core Lenovo Computer Windows 7 Home Premium 64-bit. This is a very compact computer and is only about 4" high. It is a perfect solution for using where space is limited. 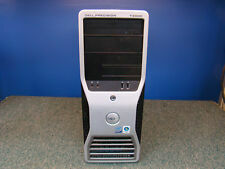 It can operate horizontally as a desktop as shown in the photo, or it can operate vertically as a tower. 1TB Hard Drives. Hardware Connectivity: DVI Form Factor: Tower. Fresh Microsoft Windows 7 pro installed on it. Graphics Processing Type: Dedicated Graphics Product Line Used:An item that has been used previously. 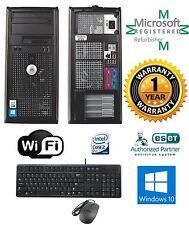 Fast Dell OptiPlex 780 PC COMPUTER DESKTOP. 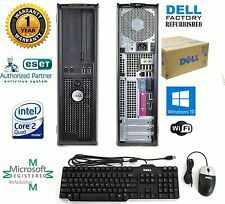 OptiPlex 780 PC COMPUTER DESKTOP Network Card Dell Primary Drive or Optical Drive WINDOW 10 Pro 64Bit. INCLUDES WINDOW 10 pro INSTALLATION DISK. WINDOW 10 Pro.